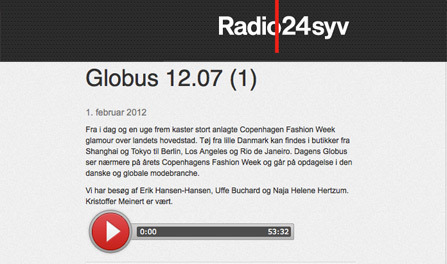 2012-02-01 Erik Hansen-Hansen in Danish Radio24syv ‘Globus’ about the Danish fashion industry. In discussion with various Danish fashion actors, i.e. Uffe Buchardt, Michael Holm at Kopenhagen Fur, Anne Mette Zachariassen at TEKO. The subject is Danish fashion versus international fashion, Copenhagen Fashion Week, design driven fashion versus price driven fashion, and luxury fashion. Host is Kristoffer Meinert.